MACKENZIE’S MAGIC (Dan Trimmer) Tetraploid (Asian Fairy Bluebird x Precious Candy) 29" EM Re. Ev. 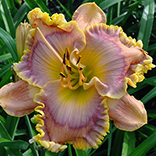 This striking Ivory and plum bloom has a huge yellow green throat and plum and gold double edge. From the first day I saw MACKENZIE bloom I knew she would be one of my favorites, but little did I know what a wonderfully exotic parent she would be in my emerging patterned eye program. The extremely large throat made the patterned eyes in the next generation show so far out on the petals that I selected almost every seedling for further evaluation due to their uniqueness, and it is the reason I crossed on so many blooms this year. I introduced BOCA RATAN for the express reason that this full sibling was just so easy a pod set, where MACKENZIE’S MAGIC set fewer pods. 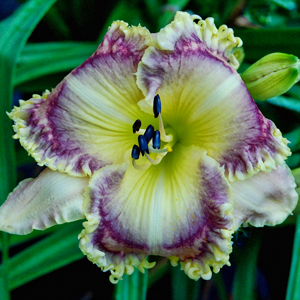 Bud count is about 25 carried on three lateral branches topped by a terminal Y. I believe this is a very important daylily. Very Limited.